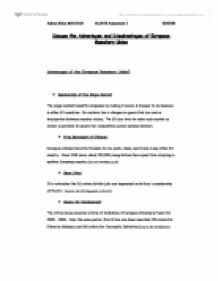 Discuss the Advantages and Disadvantages of European Monetary Union Advantages of the European Monetary Union? * Membership of the Single Market The single market benefits companies by making it easier & cheaper to do business in other EU countries. No customs tax is charged on goods that are sold or transported between member states. The EU also tries to make each market as similar as possible to ensure fair competition across national borders. * Free Movement of Citizens: European citizens have the freedom to live, work, study, and travel in any other EU country. Since 1995 alone, about 100,000 young Britons have spent time studying in another European country. (Source: www.bized.ac.uk) * More Jobs: It is estimated the 3.5 million British jobs are dependent on Britain's membership of the EU. ...read more. When the EU speaks it represents about 400 million people .This is more than the combined population of the United States & Russia. (Source: EU official website) * Greater Protection for Workers: The European Working Time Directive is an EU initiative designed to protect workers from exploitation by employers. The directive lays down regulations on matters such as how many breaks an employee can take, and how many holidays they are entitled to each year. It also aims to limit the average time an employee can be compelled to work to 48 hours a week. (source:Bized) * Greater Equality and Social Inclusion: Through EU directives citizens are protected from employment discrimination on the basis of gender, sexual orientation, religion or belief, disability and age. ...read more. People who are affected by EU decisions have little chance to make their voices heard. * Concentration of Power: EU institutions have too much power. They have taken away the right of individual countries to make their own decisions about economic and political matters. (source:Tutor2u.net) * Speed of Integration: The EU is moving towards more and more integration at a phenomenal rate with not enough thought or debate on the issues. The UK risks being swept by this tide of integration without plotting and following its own course in the interest of its own citizens. * Loss of UK Sovereignty: Membership of the EU has led the UK to lose its sovereignty. As a result the UK is no longer free to develop its own policies, make its own laws, or control its own economy in response to its own needs. ...read more. There are many different cultures and languages in the EU, the United Kingdom has a different culture to Germany as the way of living in both countries is different. The United Kingdom joined the EU in 1973 and its population is roughly around 60 million, the population increases roughly about 1/2% every year. This threatens those that are less efficient as they will find it very difficult, if not impossible to compete with more efficient producers from outside their domestic market. With trade blocs promoting the efficiency of the world's economy, in that production costs are reallocated from high producers to low producers within the trading bloc, they actually damage economic efficiency. When the EU speaks it represents about 400 million people (this will be 500m after enlargement). This is more than the combined population of the United States & Russia. Margaret Thatcher has said: ?On our own, as a nation of 55 million, we would have some voice, but not enough." Pain, N and Young, G., Continent Cut Off? The Macroeconomic Impact of British Withdrawal from the EU, NIESR, February 2000. Republished as, "The macroeconomic impact of UK Withdrawal from the EU", Economic Modelling, 21 (2004), pp. 387-408. They concluded that there was, "no reason to suppose that unemployment would rise significantly if the UK were to withdraw from the EU". Because the EU is still accepting new members (growing) taxes might be increased to help new members reach the required standards. An increase in taxes will have a large impact on UK businesses, as they might have to pay out more money in form of taxes or the public spending will go down. The European Parliament is the only EU body, which is directly elected. It consists of 626 elected MEP's represent the 15 member states of which the UK has 87 (Mercado 2001.) The powers of the European Parliament fall into three categories, the first is legislative power which includes Co-decision procedure which I will cover later. on Austria and the EU). Austria's main trading partners are in continental Europe, especially neighbouring Germany, Italy, and Switzerland. Because of a heavy dependency on imports, Austria usually has a negative trade balance, which is compensated for by positive services; tourism is especially important in reducing the negative trade balance.